Flatt and Scruggs are one of the most popular bluegrass bands of all time. Along with Bill Monroe, they propelled this great style into a widely successful and artistically praised musical format. The Best of the Flatt and Scruggs TV Show series contains the best musical performances from a long lost TV showtaped in the 1950s and 1960s. Never available before, this footage features Flatt and Scruggs in their prime with their group the Foggy Mountain Boys playing many of their most famous songs as well as many other bluegrass classicsFlatt and Scruggs are one of the most popular bluegrass bands of all time. Along with Bill Monroe, they propelled this great style into a widely successful and artistically praised musical format. 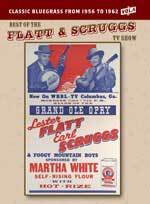 The "Best of the Flatt and Scruggs TV Show" series contains the best musical performances from a long lost TV show taped in the 1950s and 1960s. Never available before, this footage features Flatt and Scruggs in their prime with their group the Foggy Mountain Boys play- ing many of their most famous songs as well as many other bluegrass classics. The Best of the Flatt and Scruggs TV Show series contains the best musical performances from a long lost TV showtaped in the 1950s and 1960s. Never available before, this footage features Flatt and Scruggs in their prime with their group the Foggy Mountain Boys playing many of their most famous songs as well as many other bluegrass classicsFlatt and Scruggs are one of the most popular bluegrass bands of all time. This 2-disc set features over 20 songs from the 2002 live performance by this bluegrass ensemble in Louisville, Kentucky. Disc 1 includes live performances of all the songs, while Disc 2 includes interviews, behind-the-scenes footage, and more. With uncommon passion and devotion, High Lonesome traces the evolution of bluegrass, one of America's most vital musical fusions, from its folk roots in the Kentucky hills through the innovations which shaped its most modern forms. The Telluride Bluegrass Festival has become an annual destination for acoustic music fans who make the pilgrimage to this town in Colorado's San Juan Mountains. For one historic evening, American music legends Earl Scruggs, Doc Watson and Ricky Skaggs joined forces as "The Three Pickers" to film a concert for public television, along with special guest Alison Krauss. Includes a bonus documentary. 85 minutes. On this DVD Flatpicking Guitar Magazine presents three of the most talented guitar players in acoustic music performing together in a live concert setting. Bryan Sutton (IBMA Guitar Player of the Year award winner, former lead guitarist with Ricky Skaggs and Kentucy Thunder, and one of Nashville's top session players), Jim Hurst (two- time IBMA Guitar Player of the Year award winner), and highly respected guitar veteran Tim Stafford (Dusty Miller, Alison Krauss + Union Station, Blue Highway) provide a thoroughly enjoyable performance. This performance DVD features advanced solo arrangements by Steve Kaufman accompanied by Joe Carr. Kaufman's breezy, informal presentation puts the listener at ease and belies the complexity of his fluid technique, flawless musical taste, and rock-solid sense of timing. Download now from PlayBetterBluegrass.com !